She is perfectly trainable in the hands of a person who likes youngsters and knows how to deal with them and their various temperaments. she is NOT A LOST CAUSE!!! ... Although she tried mouthing and jumping and leash biting, she was perfectly manageable and quite pleasant to spend time with. she was very sociable, loved the company of many people, played nicely ... she is still a little one. Death should not knock at her door and win, but it will unless a foster or adopter opens their heart. 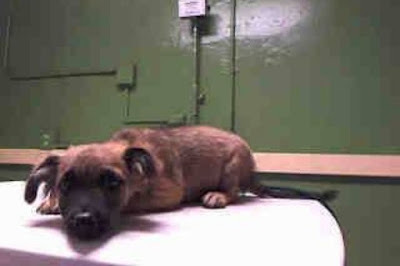 NOT RESERVED - PUPPY GIRL WILL BE KILLED SHORTLY at Los Angeles County Animal Control – Carson. A volunteer writes: “Puppy girl listens with a big smile, bright eyes and a wagging tail. she sits and stays and even gives me paw…. she really can listen even if, true, she tried to test my patience a few times. Free in a pen and exhausted by the heat and the sun, Puppy girl decides to take a bath in the swimming pool. she is not afraid of the water. she has a ball and a toy..A hand pets her head and feeds her treats….What more does a little puppy want? Puppy girl won me over. I would adopt her in a heartbeat if I was younger…Puppy girl has a good heart, is friendly, very sociable(even in crowds of people), loving, smart and open to learn as well as to have fun." I'm an approximately 2 month old female Chihuahua. I am not yet spayed. You can visit me at my temporary home at CRECEIVING. This young gal’s time is nearing the close of life. Share her plight with approved rescue organizations, friends, family and social media contacts. Puppy girl’s options depend on all of us.